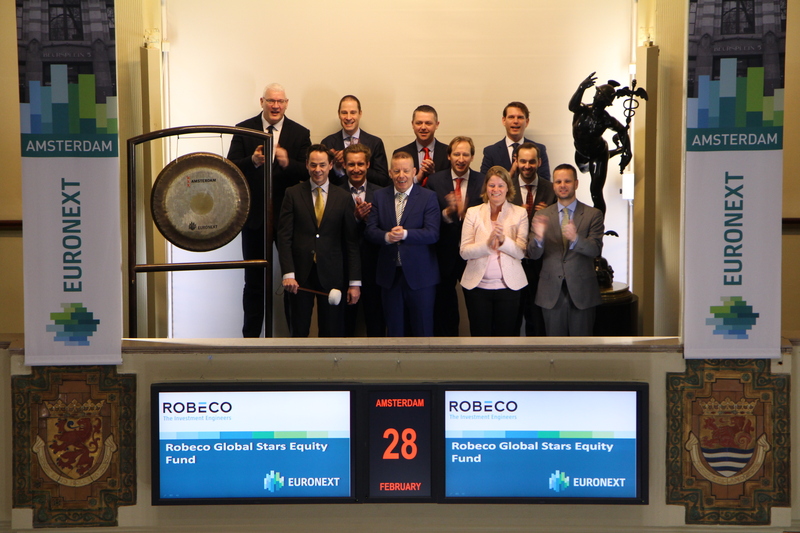 Robeco opens the Stock Exchange to celebrate the 80th listing-anniversary of Robeco Global Stars Equity Fund N.V.
Today Robeco opened the trading day on the Amsterdam Stock Exchange to celebrate the 80th anniversary of the listing of the Robeco Global Stars Equity Fund N.V. (formerly known as Robeco N.V.), on 3 March 1938. This event made investing in a globally diversified portfolio accessible for anyone in the Netherlands with sufficient means to buy a share for a hundred Dutch guilders (equivalent to circa EUR 45 in 1938 and circa EUR 940 today). 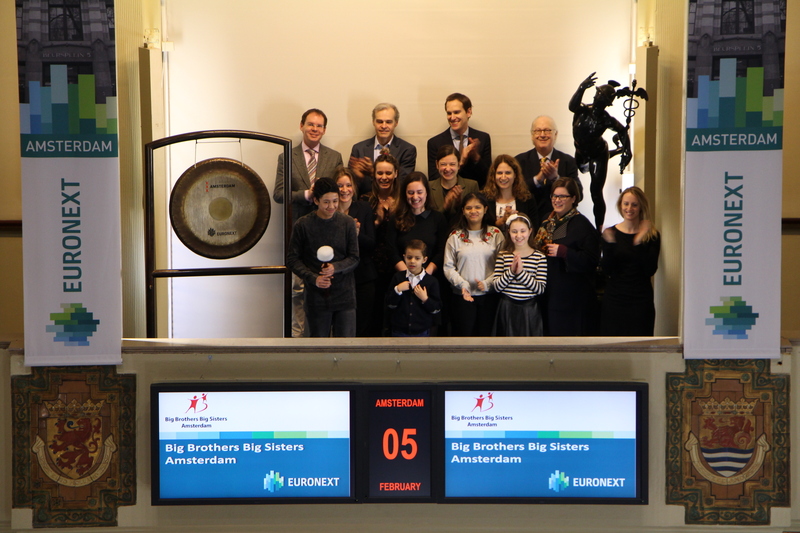 Closing bell ceremony with John Swolfs, CEO Inside ETFs, to kick-off the Trends Investment Summit Benelux organized on 28 February in Brussels. Every year 550 children in the Netherlands get cancer, 75% of these children are currently in recovery. This figure must be improved. The goal of KiKa is to increase this percentage to 95%. KiKa raises money for better research and other improvements in the field of children’s cancer, focusing on decreasing pain during treatment, increasing recovery and a higher quality of life for patients. Do you have a storage or a garage? See what you can spare. Things that you have not been using for years. Because if we all start cleaning-out our closets, that old cabinet or those toys that nobody glances at, might be worth a high-tech research centre! Place an advertisement of the things that you can spare on www.marktplaats.nl/kika. The money from the sale will go straight to KiKa’s bank account. Off course you can also buy things yourself because all proceeds will go to KiKa! 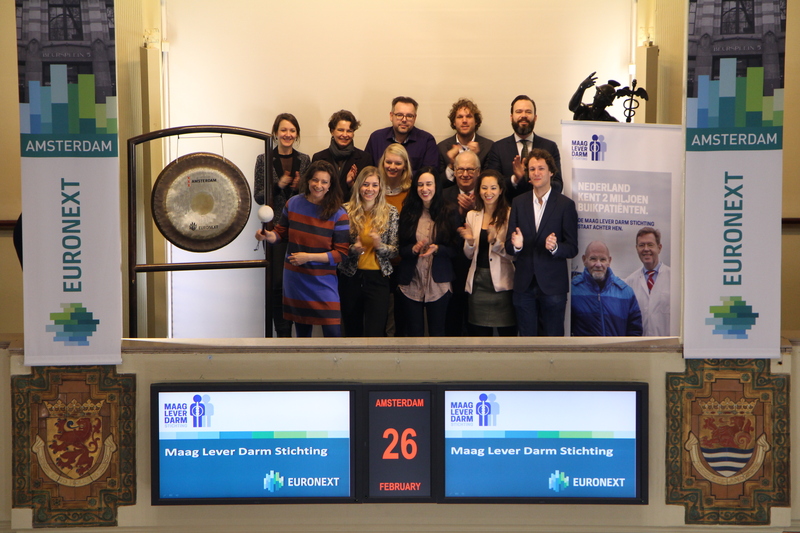 The Maag Lever Darm Stichting, a foundation, opens trading by sounding the gong in the first week of Colon Cancer Awareness month March. Every year nearly 15.000 people in the Netherlands are diagnosed with colon cancer. The Foundation finances scientific research, initiates care projects and informs the general public and stakeholders. The funded research contributes to better diagnostics and treatment of colon cancer and a range of other digestive diseases. Colon cancer can be treated effectively if diagnosed at an early stage. Because of this, all men and women aged between 55-75 are invited for a national population screening. Beside the screening, it is important to stay alert for signals that might point to colon cancer. Maag Lever Darm Stichting is creating extra awareness for the Seven Signals-test that explains these signals in more detail. 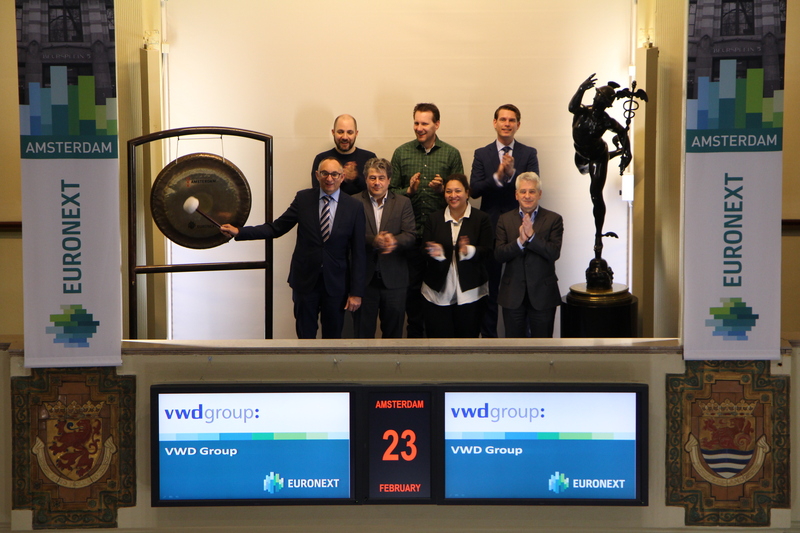 vwd group Netherlands, one of Europe's leading suppliers of information and technology solutions for the investment industry, celebrate this year its 30th anniversary. Wherever systematic support for financial decisions is required, vwd provides the right solutions, products and data. Their scalable and highly configurable technology, data platforms, systems and interfaces set the standard for the investment industry. With vwd group solutions, product- and customer processes can be optimized to increase business potential while complying with regulatory requirements. 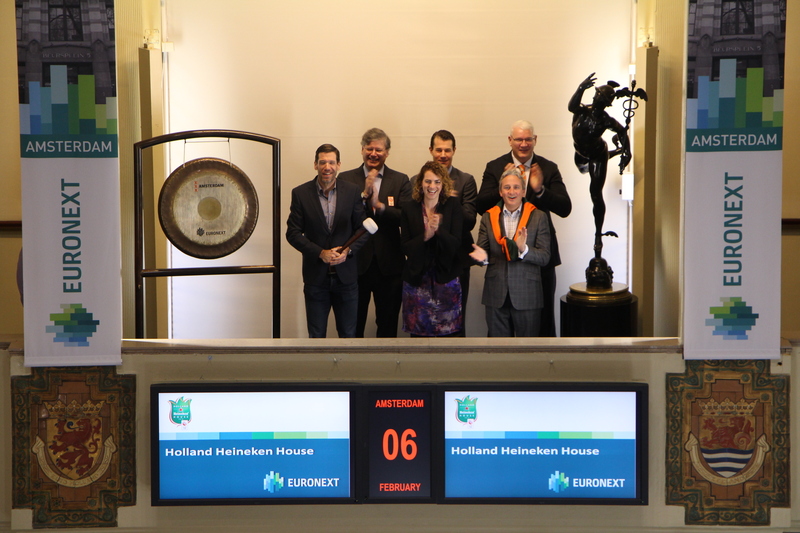 Euronext Amsterdam welcomes Dutch Star Companies ONE. 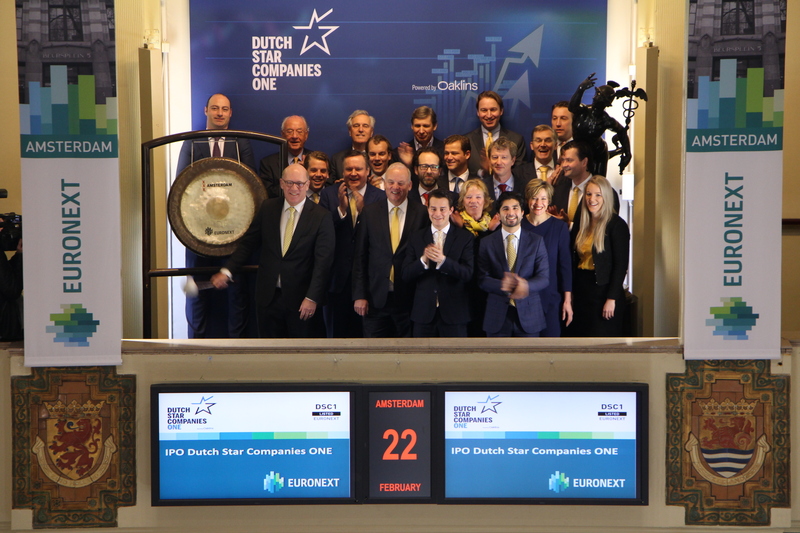 Dutch Star Companies ONE N.V. (ticker symbol: DSC1) starts trading as the first special purpose acquisition company (“SPAC”) currently listed on Euronext Amsterdam. Stephan Nanninga Executive Director and promotor of Dutch Star Companies ONE sounds the gong accompanied by a.o. Niek Hoek, Executive Director and promotor and Gerbrand ter Brugge, Non-Executive Director and promotor of Dutch Star Companies ONE. The purpose of Dutch Star Companies ONE is to acquire a significant minority stake in a business with principal operations in Europe, preferably in the Netherlands. Dutch Star Companies ONE shall seek a business combination with the following characteristics: A family business, carve-out or private equity exit with an EBITDA between 25 to 75 million euro, strong competitive position within its industry and an experienced management team that financially performed well in recent years and active in the industrial, agriculture or maritime sector, or involved in wholesale, logistics or “smart” production. Dutch Star Companies ONE is powered by Oaklins based on its successful launch of three Italian SPAC’s. 99% of the equity raised in the IPO will be deposited in an escrow account until 70% of the shareholders meeting of Dutch Star Companies ONE has approved the investment in a business combination. To celebrate the collaboration on index-related business mr Sang Hwan An, President & CEO of KRX and Michael Hodgson, Head of Information Services, Market & Global Sales ring the opening bell at Euronext Paris. 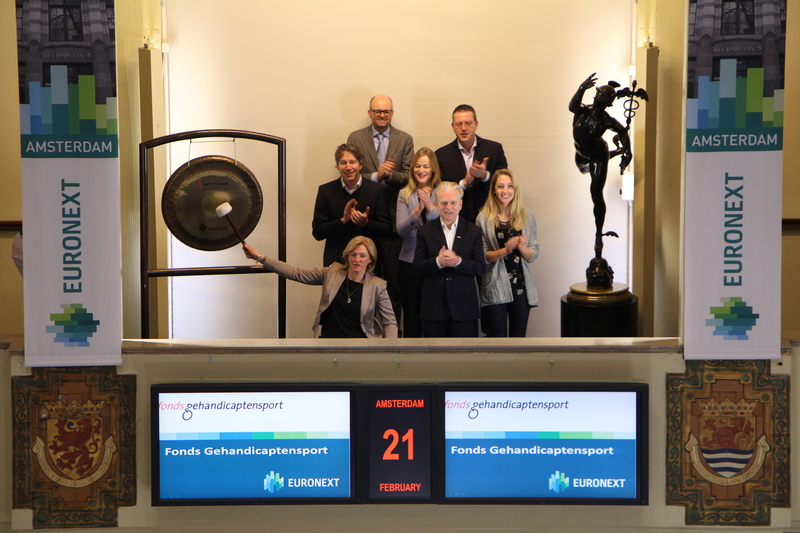 Fonds Gehandicaptensport and the Dutch Golf Federation (NGF) sound the gong to mark the introduction of the ‘Sportsfund GOLF’- a fund to make golf more accessible to people with a disability. Sportfund GOLF will give (financial) support to golf clubs for athletes with a physical, intellectual or invisible handicap. Because of the EGA handicap system, golf always have the possibility, to enjoy the sport with or without any of the above mentioned handicap. Fonds Gehandicaptensport is initiator of the platform 1% FairShare ®. 1% FairShare ® means that sportsponsors are being asked to invest at least 1% above their total budget of sportsponsoring into the sport for people with a disbaility. Among others, ING bank is one of the 1% FairShare ® partners of Fonds Gehandicaptensport. ING Private Banking is main sponsor of the Golf sport in The Netherlands. 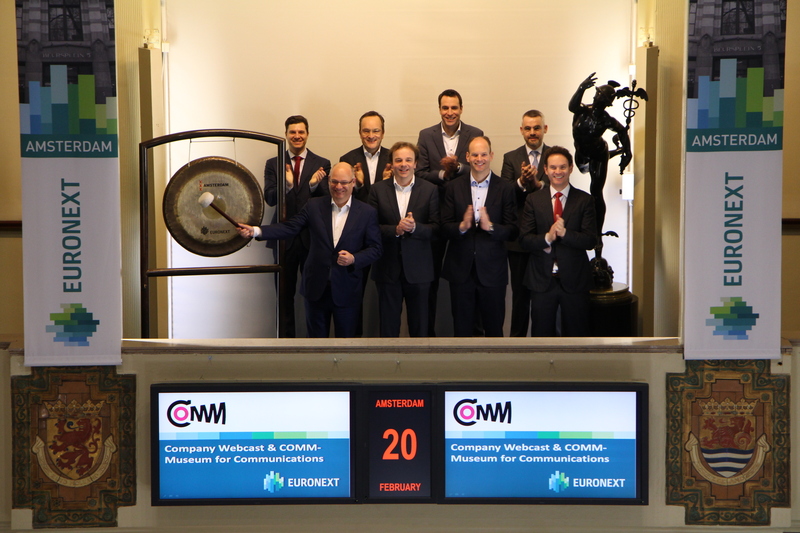 Company Webcast, part of Euronext, opens trading by celebrating the opening of their newest webinar studio, based in COMM – Museum for Communication. Company Webcast is specialised in professional webcast and webinar services. They are based in the Netherlands and provide high-end webcast and webinar solutions to more than 260 corporates and local governments. With the state-of-the-art next generation webcast platform, Company Webcast helps IR managers to maximize the impact of their event. For over 12 years Company Webcast has been a trustworthy partner and the market leader for Investor Relations webcast in the Netherlands. Better Options Amsterdam BV, trading firm residing at Beursplein 5, opens trading with the Giving Back Foundation. 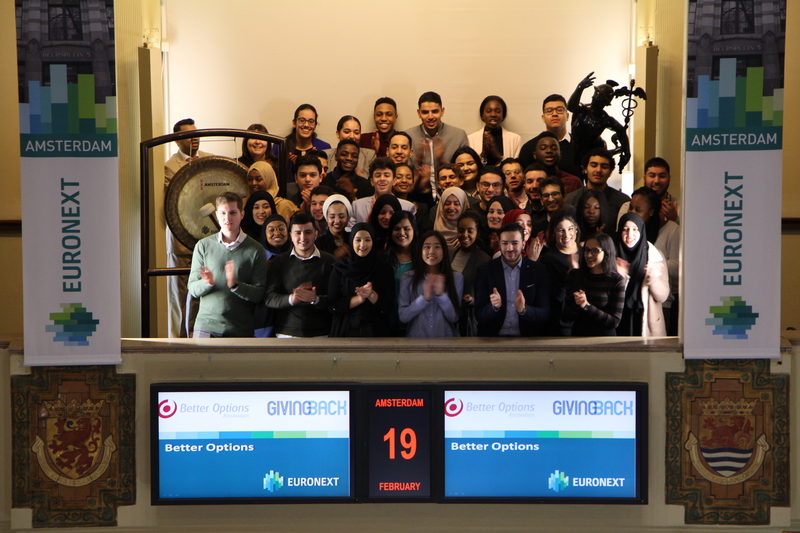 Amsterdam students of this Foundation are invited for a day at the trading floor. The Foundation stands for diversity and offers young people from different backgrounds the opportunity to develop their talent. They are focused on a broad group of talented pupils, students and young professionals and offer a challenging learning program to develop on a personal and professional level. The program consists of workshop and events, as well as a mentoring program. 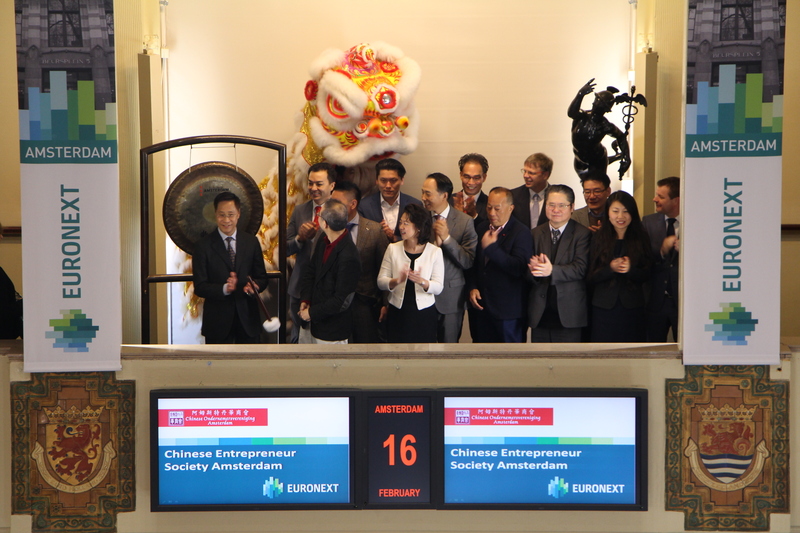 The Chinese Entrepreneurs Association Amsterdam celebrates the Chinese New Year by sounding the gong. 16 February 2018 is the start of the Chinese year of the Dog. The Chinese New Year is the most important celebration of the Chinese calendar. It is celebrated almost everywhere in Asia, as well as abroad there where a Chinese population group has settled. In Amsterdam, Chinese New Year is traditionally celebrated in Chinatown. The Chinese Entrepreneurs Association Amsterdam has been organizing the largely public celebrations for years. Hendrikje Crebolder, director Development & Media Rijksmuseum opens the trading day at the Amsterdam exchange with main sponsor KPN to celebrate the launch of Rijksmuseum’s completely revamped smartphone app. A simple press of a button now gives users access to 14 tours, an advanced navigation system, the e-ticket shop and the Rijksmuseum collection. Now, the Rijksmuseum is even more accessible, whether it’s before, during or after a visit to the museum. The Rijksmuseum has developed this app in response to new developments in media engagement and the growing numbers of people taking advantage of the benefits offered by their smartphone. The Rijksmuseum app was created with the support of KPN (ticker symbol: KPN), the Rijksmuseum’s main sponsor. The app was developed in collaboration with KPN, Fabrique, Q42 and Movin. The Forgotten Child Foundation (Stichting het Vergeten Kind) opens the Amsterdam exchange on Valentine’s Day, the day of love, and asks attention for the 100,000 children in the Netherlands who grow up in families with multiple problems that hardly receive any positive attention. To support these children, the foundation calls on the Netherlands to warm these children with a kilometer-long support scarf of sweet messages, via their website, until 25 February. After the promotional period, the Forgotten Child Foundation hands them out, scarf by scarf, to vulnerable children in the Netherlands. Joep Verboeket, managing director: "By creating the longest support scarf, we want to ask the Netherlands to open her heart to vulnerable children. We emphasize that sincere attention can be found in small things. We can all do something for these children, so that they get what they are entitled to: a chance for a bright future. And the beauty is, at the end of the campaign the scarves are separated and donated to the children who need our support so badly. " 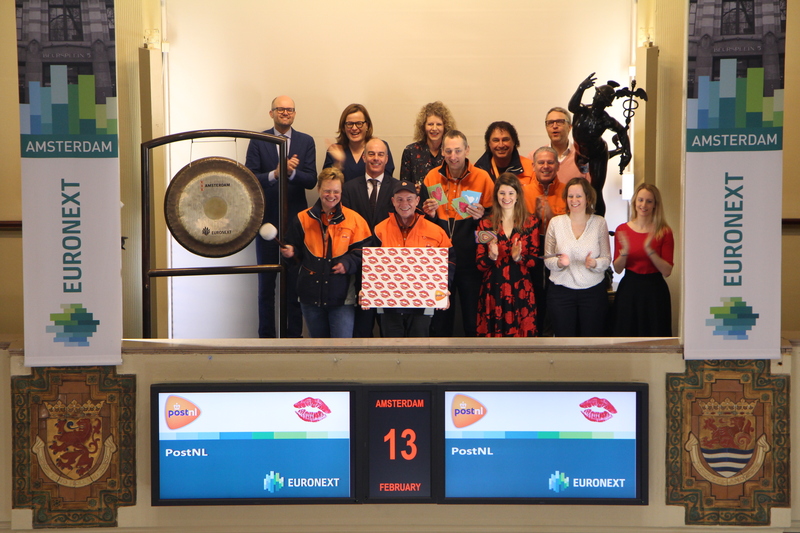 Postal workers from PostNL (ticker symbol: PNL) visit the Amsterdam exchange and open the trade on the occasion of Valentine's Day. Expressing your love is not always easy. Expressing it with a card is. Valentine's Day is a good time to share your feelings. This year too, PostNL offers the possibility to send a valentine card with a kiss instead of a stamp. Mail the card today (Tuesday 13th) before 17:00 and the postman will deliver the card to your loved one on Valentine's Day. 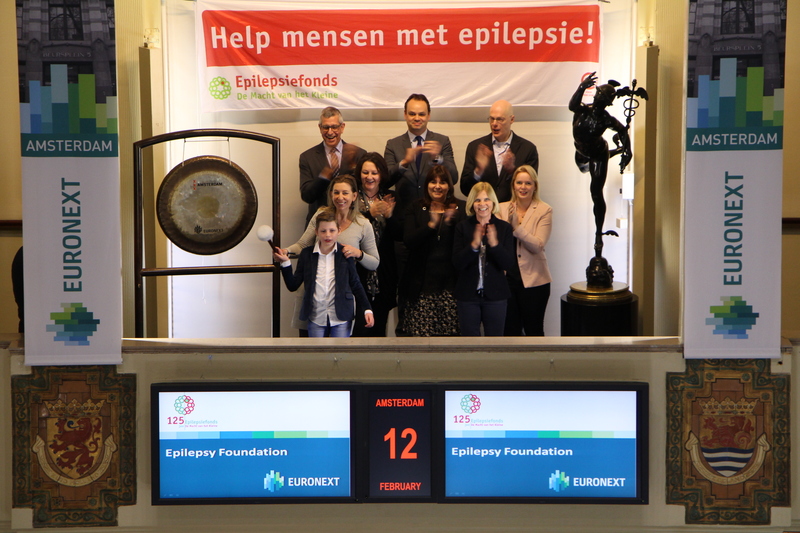 The Epilepsy Fund opens the Amsterdam exchange on World Epilepsy Day. The fund, founded 125 years ago, calls for attention to the disorder of epilepsy, the consequences it has and the taboo that it surrounds. Matthijs (9) sounds the gong. He became seizure free 18 months ago thanks to a radical brain operation. Thanks to a large group of donors, the Epilepsy Fund is committed to people like Matthijs for 125 years. The fund celebrates this anniversary year by dedicating extra attention to and research into epilepsy. Because epilepsy has a profound effect on life. By means of research, information and assistance, the Epilepsy Fund makes every effort to offer people with epilepsy and their loved ones a better quality of life. On Monday 12 February, the ABN AMRO World Tennis Tournament will start for the 45th time. The tournament is part of the ATP 500 category and is therefore one of the 25 most important tennis tournaments in the world. Several top-10 players will participate this year. Among others, Roger Federer, Grigor Dimitrov, Alexander Zverev and David Goffin will come into action. Furthermore, well-known players such as Stan Wawrinka, Jo-Wilfried Tsonga and Robin Haase are present in Rotterdam. The cooperation between main sponsor ABN AMRO (ticker symbol: ABN) and Rotterdam Ahoy is the longest running title sponsorship on the ATP World Tour. To honor that, Richard Krajicek, Wimbledon winner in 1996 and Tournament Director, opens trading. 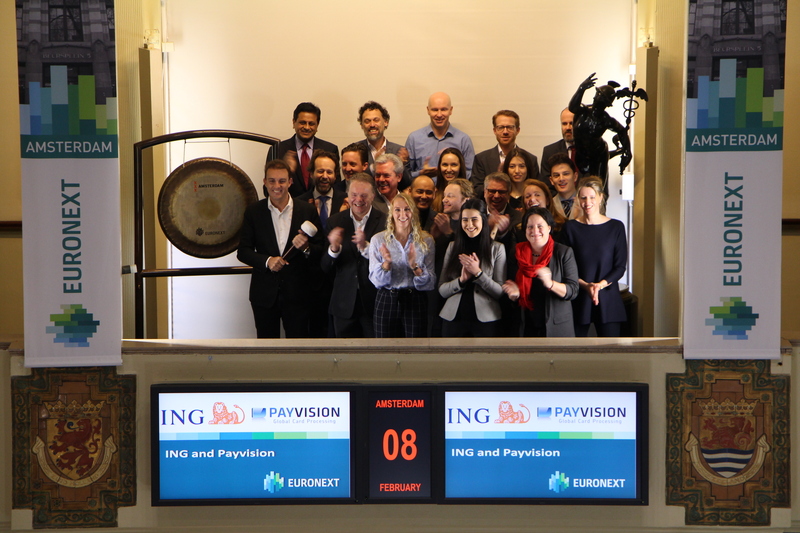 Rudolf Booker, founder and CEO Payvision, together with Mark Buitenhek, ING’s Global Head of Transaction Services sound the gong and open the trading day in Amsterdam, celebrating the recently announced strategic partnership between ING and Payvision. Through this collaboration, ING further invests in the payments business by acquiring 75% stake in Payvision, strengthening its footprint in omnichannel payments and expanding its merchant services. ING business customers will be able to accept payments through any channel, including in store terminals and web shops and through any device. For Payvision, this new synergy will accelerate its ambitious growth plans within the dynamic payments market, extend its global network and broaden its payment product portfolio. The partnership supports Payvision’s goal to create innovative, tailor-made payments products designed for the fast-paced international retail environment. IT4Kids Foundation visits the Amsterdam exchange and opens the trading day with a sounding of the gong by founder Jordy Kool. By sounding the gong he literally and figuratively makes noise for the IT4Kids Foundation. IT4Kids was founded in 2013 and is committed to helping children. The Netherlands is one of the richest countries in the world. Yet as many as 1 in 8 children grow up in a family that has to live on a subsistence level. Many children from this group miss out on the opportunity to play sports. Values ​​and skills such as resilience, cooperation, dealing with loss and respect are taught when participating in sports. Values ​​and skills that are so important in every phase of life. IT4Kids collects used and written off hardware and, on behalf of the donor, donates the value to charities that are committed to children. 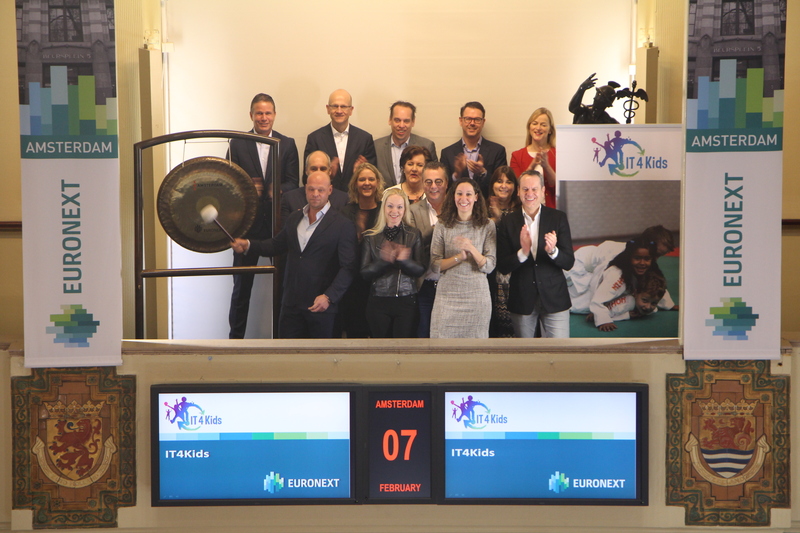 IT4Kids organized a gala last October during which € 418,000 was collected, and recently received donations from, amongst others, the Rabobank Bollenstreek. Heineken (ticker symbol: HEIA) sounds the gong at the Amsterdam exchange. The ceremony does not only mark the opening of trading, but also acts as a pre-opening ceremony for the Olympic Games and the Holland Heineken House, which will officially open on the 9th of February. The Holland Heineken House, hosted by The Netherlands Olympic Committee (NOC*NSF) and organized by Heineken, is the official national house of The Netherlands during the Olympics. The Holland Heineken House is the place where sports and emotions come together to create unforgettable experiences. Guests from all over the world are invited to watch all action live on the big screens and experience spectacular stunts, emotional award ceremonies and thrilling performances by some of the best Dutch artists. Because many Dutch fans in the Netherlands, who cannot attend the Holland Heineken House, have to miss its unique atmosphere, Heineken is introducing Holland Heineken Thuis in the Grand Café Heineken Hoek on the Leidseplein in Amsterdam. From the 9th until the 25th of February Holland Heineken Thuis will be the place to celebrate the Olympic Games and Dutch athletic performances in the Netherlands. Société Générale innovates with the launch, in partnerhsip with Boursier.com, of the first Certificate indexed on a basket of 10 major French stocks equally weighted picked by Boursier.com. The basket includes Veolia, Orange, Somfy, Eurazeo, Ingenico, Carrefour, Air Liquide, Valeo, Bouygues and Icade. The Certicate issued by Société Générale allows investors to replicate the performance of the basket. It is listed on Euronext Paris and can be traded as simply as a share through an online broker or a bank. Big Brothers Big Sisters (BBBSAm) exists in Amsterdam for five years. To celebrate this festive moment, one of the “Littles” from BBBSAm sounds the gong. Big Brothers Big Sisters Amsterdam is a mentor organization that works for children and youth between the ages of 5 and 18 who live in poverty. They make meaningful matches between these children and mentors/volunteers, who bond with them, give them plenty of attention and undertake fun and educational activities with them on a weekly basis. They help these children on their way to a better life: they broaden their horizons, stimulate their talents, increase their self-confidence and their social skills. They ensure that the children will fully develop and that they have a happy, successful future. Big Brothers Big Sisters Amsterdam is supported by the Janivo Foundation, a fund that works for children and young people who can use a helping hand. Flow Traders sounds the gong on the Amsterdam exchange of Euronext together with Morningstar and Euronext, for the launch of futures on the Morningstar® Eurozone 50 IndexSM on the Derivatives Market of Euronext Amsterdam. Yannick Ignoul of Flow Traders, sounds the gong and opens the trading day. Morningstar, Inc. is a leading provider of independent investment research in North America, Europe, Australia, and Asia. The company offers an extensive line of products and services for individual investors, financial advisors, asset managers, and retirement plan providers and sponsors. Morningstar provides data and research insights on a wide range of investment offerings, including managed investment products, publicly listed companies, private capital markets, and real-time global market data. Morningstar also offers investment management services through its investment advisory subsidiaries, with more than USD$200 billion in assets under advisement and management as of 31 December 2016. The company has operations in 27 countries. Euronext Brussels had the pleasure to welcome X-FAB to celebrate their “IPO of the Year” award. CEO Rudi De Winter and CFO Alba Morganti opened the trading day in Brussels, a few days after the company won the “IPO of the Year” award in the category large caps at Euronext's 7th annual Stock Exchange Conference in Paris. The award honours their successful Initial Public Offering and the company’s post-IPO performance. FISD Amsterdam is an annual event, now in its fifth year, hosted by Euronext Amsterdam. Bringing together those that buy and consume market data, such as Banks and Asset Managers, with the range of those that provide data and services. The Financial Information Services Association is a neutral forum that has served the financial information industry for 25 years. The 200+ global member companies recognize that market data distribution, efficient trade execution, and regulatory compliance require a high level of consistent and predictable service - all of which are dependent on the close cooperation of many independent organizations and systems. Industry stakeholders support FISD as the forum of choice to identify and resolve the business and technical issues that affect the administration, distribution, and utilization of financial information.